The Baldwin BH185 grand piano is built by hand to give you exceptional performance and style. Measuring exactly 6’ 1”, the full-sized Baldwin BH185 packs the imposing elegance of a concert-sized grand piano into dimensions designed to fit your intended space. With the BH185, you get the rich, resonant voice and lovingly crafted lines of a full-sized grand. It just begs to be played. 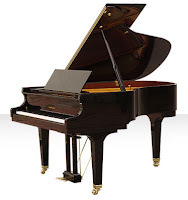 A grand piano is to be the focal point of any room it occupies. This is especially true in smaller living areas. The Baldwin BH185 offers elegance that fits into your life without compromises. Find it at your nearest authorized Baldwin piano dealer. Own the BH185 in the finish of your choice — Polished Ebony, Polished White, Polished Mahogany or Satin Ebony.